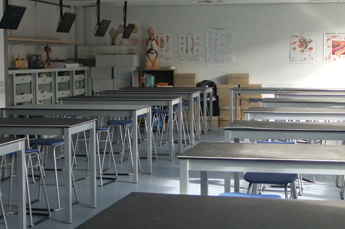 One of Bournemouth University’s dedicated biological anthropology laboratories. Bournemouth University School of Applied Sciences and Archaeology department curates a wide range of skeletal collections from archaeological sites across Europe. Most of our collections comprise human remains uncovered during excavations in the south-west of England, but we also hold material on loan from museums and organisations across the world. The majority of our collections are used in teaching and many are currently the subject of research by both staff and students. If you’d like to make a request to use the collections, please fill out this form. Sidon, Lebanon. Bronze Age, 80 individuals, mostly juveniles. Eggardon Hill, Dorset. Bronze Age. One urned cremation (also three Anglo-Saxon inhumations). Bucknowle Roman Villa. Romano-British. Four individuals, all perinates. Dewlish Roman Villa. Romano-British. Eight individuals in three graves, all perinates. Durotriges Big Dig, Winterbourne Kingston, Dorset. Late Iron Age-Romano-British. Ongoing excavations. Goldfield’s Farm, Farnham, Dorset. Romano-British. Eight inhumations and one cremation. Illford Castle Farm. Romano-British. Two individuals, all perinates. Kimmeridge, Dorset. Iron Age. Two individuals – adult and perinate. Langton Herring, Dorset. Iron Age. One individual from mirror burial. Piddle Hinton, Dorset. Romano-British. One individual. Bradford Peverell, Dorset. c.7th century. 20 individuals. Eggardon Hill, Dorset. 8th century. Three inhumations (also one Bronze Age urned cremation). Race Down Long Barrow, Blandford Forum, Dorset.5th-7th century. One individual, juvenile. 2 Church Street, Romsey. Likely 19th century. Two individuals with evidence of anatomical dissection. Bathford Quaker burial ground. 1703-1845. 26 contexts mostly disarticulated mandibles and maxillae. Dorking Baptist burial ground. Surrey. c.1840-1900s. 33 individuals. Portland St Andrew, Dorset. Anglo-Saxon/12th-18th century. 73 individuals. Quaker Burial Ground, Kingston-upon-Thames. A.D. 1664-1814. 59 individuals. St Augustine-the-Less, Bristol. Late Anglo-Saxon-19th century. 137 in situ burials and a minimum number of 858 disarticulated individuals. Taunton, Somerset. A. D. 1807. One individual and multiple dentitions. Waddon, Dorset. One individual, cranium with sharp force trauma – On long-term loan from Dorchester Museum. Auton, J. 2010. A demographic and palaeopathological investigation of an Anglo-Saxon cemetery population from Bradford Peverell, Dorset. Unpublished Masters dissertation. Bournemouth University. Boore, E. J. 1985. Excavations at St Augustine the Less, Bristol, 1983-4. Bristol and Avon Archaeology 4: 21-33. Bashford, L. and Pollard, T. In the burying place – the excavation of a Quaker burial ground. In Cox, M (ed). Grave concerns: death and burial in England 1700-1800. York: CBA research reports, pps 154-66. Manley, H. 2010. Analysis of remains recovered from Race Down, Blandford. Unpublished report for Bournemouth University. O’Connell, L. 1999. The articulated human skeletal remains from St Augustine the Less, Bristol. Unpublished report for Bournemouth University. Ogden, A. R. 2004. Burials excavated at Sidon 2001-2003. Archaeology & History in the Lebanon 20: 58-59. Ogden, A. R. and Schutkowski, H. 2004. Human remains from middle Bronze Age burials at Sidon, Lebanon: The 2001 season. Levant 36: 159-166. Ogden, A. R., Doumet-Serhal, C., Anderson, A., Hofbauer, H., Keefe, K., Mikulski, R., Power, R. and Schutkowski, H. 2011. Human remains from twelve years of excavation in Sidon, Lebanon. Archaeology and History in the Lebanon 34/35: 226-235. Raes, A. 2005. Palaeopathological investigations into the articulated human remains from Old St Andrew’s Church, Portland, Dorset. Dorset Proceedings 127: 67-76. Start, H. and Kirk, L. The bodies of friends – the osteological analysis of a Quaker burial ground. In Cox, M. (ed). Grave concerns: death and burial in England 1700-1800. York: CBA research reports, 167-77. If you would like to access the collections you can request permission by completing the form and returning it to the given address. Download external access booking form here.